Have the leaves started turning colors in your neighborhood yet? I just love those few weeks between when the leaves have turned brilliant shades of red, orange, and yellow and before they have turned brown and fallen off completely. I have previously shared activities I’ve done with my kids to help them (and me!) learn how and why leaves change colors (and see this post for a related leaf science activity for slightly older kids). 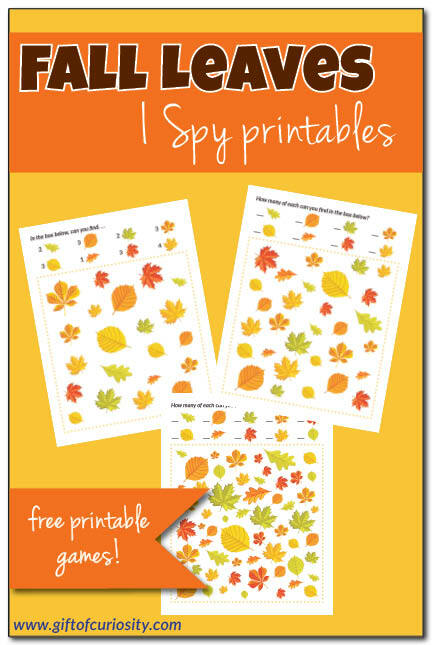 If your children have been inspired by the changing leaves outside, have them try their hand at my new Fall Leaves I Spy printable games. Note: For more fall printables and activities, see my Fall Activities for Kids page. 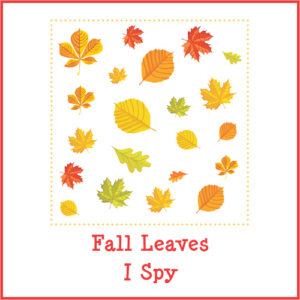 There are a total of three printable games in the Fall Leaves I Spy download, with three different levels of difficulty. This allows you to tailor the activity to your child’s level. This is also helpful when you have children of different ages who all want to do the same activity. Just select the appropriate level for each child and let them enjoy! Playing Fall Leaves I Spy is easy. Simply print the page, and then invite your child to find the pictures that are listed. Want a copy of my Fall Leaves I Spy?